"Today I realized the greatest mistake in my educational career... I ignored my mother language and chose to study English in my high school days... As a result I could hardly write a sentence in Manipuri correctly (in terms of spelling) ... A big challenge is before me... I have to prove myself as a competent sub-editor of a Manipuri daily...," this is just a simple fb status updated by one of my junior mates of a media institute that I have schooled. When this 'text' pops up on the FB page and after my eyes scanned trough it, I find irresistible to ups my thumb on his status. So, I failed not to click the like button because of genuineness of the matter highlighted and the meaning conveyed. After pondering over it again and again today, methinks English is a language that marginalized the people. This is just a simple unjustified random thought that shadowed in mind while flash-backing my memories. And this kind of unreasonable thought may also be happening to people elsewhere where English is not their mother tongue but where situations demands and make necessitate using it for communication, translation of ideas, for profession and higher education, etc. 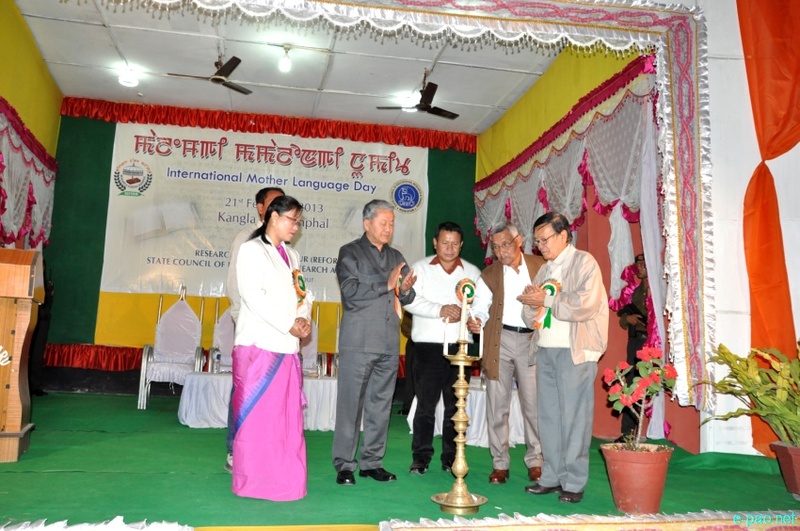 Till today, we've been experiencing an environment where English has became indispensible for our personal growth in terms of educational, professional, business transaction especially in places like Manipur we live in and day out. And, for a high profile dreamer, without the excellent knowdgfe of English, he/she would find a lot of hurdles to reach the spot where they wish to go. Today, our 'best teacher' called 'experience' that we been interacting socially and institutionally has taught and interpreted us indirectly that 'the more you excel (speak and write), the more you grow' besides your major subject of study, work or life affairs. And, the people's growing demand and it's over fanaticism has transformed like an Elixir for multidimensional development required by a person. English is a language that divides the people. As, in our current modern society, we consider 'Elites' are those who are versed in English and educated are those who are more English literate. We have almost seen the clear dividing lines created by English language from our grass-root levels and from the experiences encountered in our every life-term. For instance, we have witnessed, between the schools and its students of English and vernacular medium, between speaker and non-speakers, between the knower and non-knower. Though it was mean to be a lingua franca, many have been exercising up-to-the-minutes blindly like a fashion, to confirm their status, to show their level, to represent their standard. Meseems today, English has dominated our mother language, her phenomenal growth in an uncontrollable speed has enable her to acquire the potential to write the obituary of our own language, identity and cultural growth. Methinks, her ruling power has become powerful enough to dismantle the strings between us and our indigenous scripts and languages, history and culture. Indeed, 'truth and reality' sometimes may sound embarrassing but we have exceeded the numbers who internalized English's Literature, History, and Languages than our own. We have outnumbered the young people who read and write English than our own. We have more English readers and writers than our own vernacular one. But still we failed to realize the fact that our mother language can provide winning-support to solve indentify crisis, cultural pollution, communication imperialism, education and development flaws. But, today we should salute the decision of our state cabinet to protect and promote our language by initiating Directorate of Language. And, many Lovers and supporters living far off from homes may be applauding such landmark initiatives. And, it wont harm our brain to think with a little depth that we have long way to go, as simply setting up of a 'Directorate of Language' would not make a tremendous impact. We should participate in the promotion and protection process from individual level first. Let's promote in our family, at school first, then, automatically it would gain its potent strength to reach the higher institutional level. And, it's not too late to change and improve the things that we can, and accept our myths and misconceptions to right the wrong, to truth the false, to fill in the blanks. So, next year, we won't be lamenting on 'International Mother's Language Day' over the issue of govt. failure to take strong initiatives for development, and to promote and protect our native and state official language. But, reports on performances appraisal of the implemented programs for protection, promotion, development could lament us again. So, let's fulfill our duties as we have claimed our Rights. And, let's give no chance to our mother language to shed soulful tear again, and let give no room to us to sing 'Nuh mama, Nuh Cry', just to persuade her, that things will get better, so better no cry. Newsperson: A young monkey from 'Mahabali' Jungle was today outcast from their community for breaking their community conventions, norm and ethics. A reliable source from their flock informed us that the concerted decision was made by their community leaders after Mr. YO (name change) made frequent drop-in to 'Hard Rock Café (HRC) and tries to make his career as a DJ which causes intense embarrassment to their flock and their convention that challenges the Mahaballi's reality. Speaking in person, Mr. YO (name change) told our news person that he mistakenly took the decision by ignoring his reality by confronting their cultural and social strings attached. He further said he was empowered and self motivated after misinterpreting the meaning of Richard Bach's book 'Johnathan Livington Seagull'. He added, "Though the heterogeneous audiences of HRC like me for playing DJ, I now no more like doing any longer, now I realized my reality. As, once bitten, twice shy"